1. Refer to the exhibit. If host A sends an IP packet to host B, what will the destination address be in the frame when it leaves host A? 2. Which example of malicious code would be classified as a Trojan horse? Limit the number of unsuccessful attempts to log in to the server. Never use passwords that need the Shift key. Never send the password through the network in a clear text. Distribute servers throughout the building, placing them close to the stakeholders. Use servers from different vendors. 2. What is the purpose of issuing the commands cd nvram: then dir at the privilege exec mode of a router? 1. When retrieving email messages, which protocol allows for easy, centralized storage and backup of emails that would be desirable for a small- to medium-sized business? 2. Which application layer protocol uses message types such as GET, PUT, and POST? 2. What is a result of connecting two or more switches together? 1. What is the purpose of the startup configuration file on a Cisco router? 1. Refer to the exhibit. A switch with a default configuration connects four hosts. The ARP table for host A is shown. What happens when host A wants to send an IP packet to host D? 2. 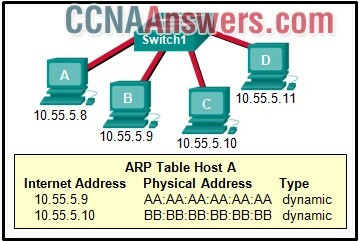 Which destination address is used in an ARP request frame? 1. Refer to the exhibit. What is wrong with the displayed termination? 2. 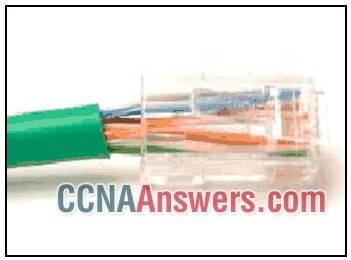 Why are two strands of fiber used for a single fiber optic connection? 1. At which layer of the OSI model would a logical address be encapsulated? 2. What are proprietary protocols?